The above info came from hamstarz, and was edited by yours truly (contact me). The image came from ChibiGojiToys. There is a place called Aurora Village, found in the frozen lands of Russia. One day, chaos was starting to arise there. Only one hamster can stop it, and that is Princess Bijou! One day, Crystal, a snow-fairy hamster, arrives. She was sent to find Princess Bijou and take her to Aurora Village. Later, Bijou stops the chaos and the villagers are happy once again. 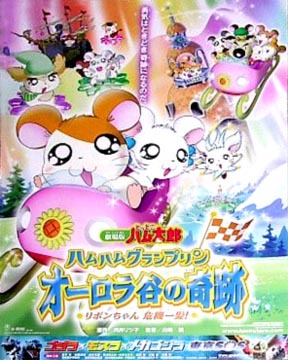 Hamtaro and the other ham-hams really miss Bijou now, so they travel to her and request her to come back. Bijou says that she must stay here, or her villagers with be full of sorrow. Soon, a pirate named Captain Hamstern comes into play. He and his ship mates ride a flying pirate ship. He sees Bijou and falls in love with her. Hamtaro becomes jealous. Now, Hamtaro must enter and beat the captain's ship mates in a kart race called the Ham-Ham Grand Prix. The ship mates drive hamster-sized race cars and Hamtaro, sadly, has to win with a sled. The prize in the race is Princess Bijou. Can Hamtaro win the race or will Hamstern? Will Bijou return home? The above description came from hamstarz, and was edited by yours truly (contact me).